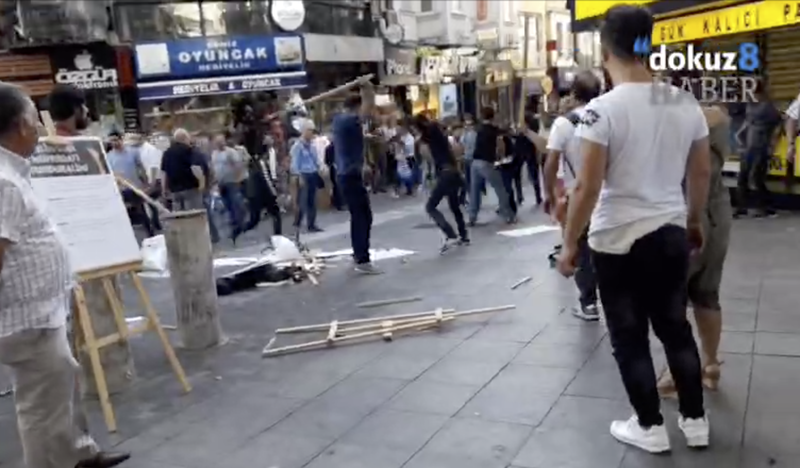 An angry mob attacked activists and parents who demanded secular education, during a protest against new educational curriculum provisioning more religious education in Turkey. Education Movement had called for a protest against educational curriculum changes, starting at 5 pm in Istanbul’s Kadıköy -a pro-secular district which would not be a site for violent protests. The protest would have simultaneous action in other cities such as Ankara and İzmir. As the protest group started gathering, a counter-protest group also formed. The violent mob equipped with iron-clubs and stones attacked the education activists and parents who demanded a more secular curriculum to be in place for 18 million students in Turkey. Kadıköy locals have joined in and defended the protestors against violent mob and attackers were pushed back. This entry was posted in AKP, Protests, Turkey, Uncategorized and tagged attack, education, islamization, istanbul, secular, secularism. Bookmark the permalink.